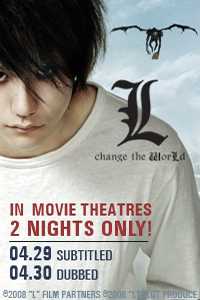 Ken'ichi Matsuyama reprises his role as L from the previous Death Note films. The film chronicles the final 23 days of L's life, as he solves one final case involving a bio-terrorist group that aims to wipe out much of humanity with a virus with one-hundred times the virulence of Ebola. He takes a boy he names Near, the sole survivor of its use in a village in Thailand, and an elementary schooler named Maki Nikaido under his wing.